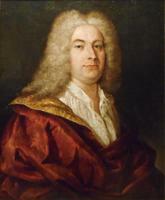 MARTEL DE BROUAGUE, FRANÇOIS, commandant of the Labrador coast, merchant, shipowner; b. 30 April 1692 in Quebec, son of Pierre Gratien Martel de Brouague and Marie-Charlotte Charest; d. probably in 1761. Thanks to his family background it was quite likely that François Martel de Brouague would succeed in a business career. Upon their arrival in the colony his father and his uncle Raymond Martel* had rapidly acquired good contacts. His father had become associated with the Charests and the Bissots, with whom he had business interests in Labrador; he even married the daughter of one of his partners, Étienne Charest. For his part, Raymond went into partnership with Augustin Le Gardeur* de Courtemanche, with whom he had interests in the Labrador trade and with whom he bought the seigneury of Lachenaie. After the death of his father François’s mother married Courtemanche. In 1702 Courtemanche obtained from Governor Callière* and Intendant François de Beauharnois a land grant in Labrador for a period of ten years, and in 1714 the king granted him the Baie de Phélypeaux (Brador Bay) and appointed him commandant of the Labrador coast. 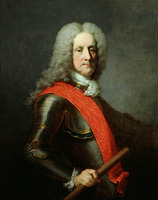 Courtemanche, whom François Martel de Brouague had been helping for some years, died in 1717, and François took his place as commandant in January 1718. At the same time he took on the management of the post at Baie de Phélypeaux in the name of his mother and half-sisters. The exploitation of this grant was the only compensation he received for his obligations as commandant: the representative of royal authority on the north coast, he had to dispense justice and defend the post of Baie de Phélypeaux and all the temporary settlements of French fishermen on the coast against raids by the Eskimos, whom he attempted, more or less successfully, to pacify [see Acoutsina*]. In 1725 François Martel de Brouague went to France to see to business matters; there, on 25 Dec. 1725, he obtained from the king a commission which granted him for his lifetime his mother’s rights to the Baie de Phélypeaux. On 21 Feb. 1726, at Versailles, Martel de Brouague married Anne-Marie Favry Du Ponceau, and the following day another royal commission ensured him and his new wife of the succession to the rights of Mme de Courtemanche and her daughters to the post in Labrador. From this first marriage Mattel de Brouague had a daughter, who lived in France with her maternal uncles until her death in 1740 at 14 years of age. His wife died around 1730 in Labrador, and on 15 Sept. 1732 Martel de Brouague married Louise, daughter of François Mariauchau* d’Esgly, who had been king’s lieutenant at Trois-Rivières, and sister of Louis-Philippe*, the future bishop of Quebec. Their marriage contract, concluded a few days earlier in Quebec, was signed by Governor Charles de Beauharnois, Intendant Gilles Hocquart*, and several members of the military and social élite of the colony. Martel de Brouague enjoyed a certain prestige as commandant of Labrador, but he did not have the financial means to develop fully his grant on the Baie de Phélypeaux. For that reason he entered into partnership with his first cousin, Pierre Trottier Desauniers, a Quebec merchant, for exploitation of the Labrador fishery in a more profitable manner. An initial agreement, signed in 1732 before the notary Henry Hiché, gave Desauniers the exclusive rights for supplying Martel de Brouague’s post and made him responsible for marketing the products of the fishery, in return for a commission of five per cent. The deed mentions in addition that Martel de Brouague owned a ship plying between Quebec and Labrador. Three years later the two partners formed a company: Desauniers put up 100,000 livres in merchandise, and Martel de Brouague brought his land grant as well as 38,000 livres he had already invested. Profits and losses would be shared equally. In five years the agreement brought Martel de Brouague nearly 28,000 livres in profits, which he sent to France. The partnership was less profitable to Desauniers than to his cousin. At the time of the dissolution of the company in 1746 Martel de Brouague took back his initial investment of 38,000 livres, as well as 93,999 livres 7 sols for his share of the profits, an equal amount going to Desauniers. During his long term in command of Labrador, Martel de Brouague concerned himself perhaps more with business than with military affairs. In 1739, in fact, the minister of Marine, Maurepas, asked Governor Beauharnois and Intendant Hocquart to warn Martel de Brouague to stop neglecting his post; if he were “the object of new complaints, the king would attend to the matter.” In addition to his exploitation of the Labrador fishery, Martel de Brouague acquired pieces of land, including the fief of Argentenay, which he first owned jointly with Desauniers. When the latter was preparing to retire to France in 1746, Martel de Brouague became sole owner of the fief, for which he had to render fealty and homage three years later. François Martel de Brouague had with the years arrived at a comfortable situation. Although all his sons died in infancy, his daughters made good matches, one of them, Louise, marrying Gaspard-Joseph Chaussegros* de Léry. According to Pierre-Georges Roy*, Martel de Brouague died at Quebec on 15 March 1761. Three years before his death there had been some talk of relieving him of his command in Labrador on the pretext that he was “old and infirm,” but he was spared this indignity. AD, Yvelines (Versailles), État civil, Versailles, 21 févr. 1726. AJQ, Registre d’état civil, Notre-Dame de Québec, 30 avril 1692, 15 sept. 1732. AN, Col., B, 49, f.687v; 65, f.45v; 68, ff.282–83; 109, f.344; C11A, 41, ff.57–63v; 43, ff.149–61v, 314–17v; 44, ff.168–69; 51, ff.29–31; 54, f.185; 65, ff.33–34; 71, ff.7–8v; 74, f.58; 109, ff.9–32, 49–59, 64–65, 65–122v, 171–84v, 200, 261, 272–309; D2C, 222, f.161; E, 177 (dossier Brouague), ff.1–9. ANQ, Greffe de Jacques Barbel, 29 déc. 1735; Greffe de Gilbert Boucault de Godefus, 20, 23 mai 1741, 7, 9 nov. 1746; Greffe d’Henry Hiché, 6 sept. 1732; AP, François Martel de Brouague; NF, Registres du Cons. sup., 1735–1736, ff.67–71; 1738–1739, ff.31–32v. PAC, MG 8, A2, 36, ff.158–59; 37, ff.54–55, 157, 167v–69; 39, ff.5–7, 109v–10, 172–73, 177v, 178v–79; B3; B6, Greffe de J.-C. Panet, 12 mars, 16 mai 1749. “François Martel de Berhouage, Brouague ou Brouage, commandant au Labrador,” APQ Rapport, 1922–23, 356–406. [In presenting these documents the author made an error concerning Martel de Brouague’s first daughter. j.i.] Inv. de pièces du Labrador (P.-G. Roy), I, 16–17, 31–32, 37–38, 42–44, 124, 125, 153–55, 239–41; II, 68–87, 187–88, 192–93, 196. “Les ‘papiers’ La Pause,” APQ Rapport, 1933–34, 218. “Recensement de Québec, 1744” (APQ Rapport), 104. Le Jeune, Dictionnaire. 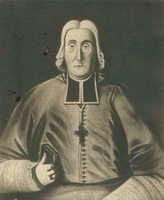 Répertoire des mariages de l’Hôpital Général de Québec (paroisse Notre-Dame-des-Anges) (1693–1961), Benoît Pontbriand, compil. (Société canadienne de généalogie, 2, Québec, 1962). Répertoire des mariages de Notre-Dame de Québec, Benoît Pontbriand, compil. (6v., Sillery, Qué., n.d.), II, 180. P.-G. Roy, Inv. contrats de mariage, IV, 224; Inv. jug. et délib., 1717–1760, III, 114, 116, 126, 129, 250; V, 10, 51, 87, 122, 123, 165, 169, 223, 282; VI, 20, 24, 25. Tanguay, Dictionnaire. La Morandière, Hist. de la pêche française de la morue, II, 669, 714–30. P.-G. Roy, Fils de Québec, I, 136–39; “La famille Margane de Lavaltrie,” BRH, XXIII (1917), 48–52; “La famille Martel de Brouage,” BRH, XL (1934), 513–49. José Igartua, “MARTEL DE BROUAGUE, FRANÇOIS,” in Dictionary of Canadian Biography, vol. 3, University of Toronto/Université Laval, 2003–, accessed April 24, 2019, http://www.biographi.ca/en/bio/martel_de_brouague_francois_3E.html.